A country of 87 million people of varied ethnic and regional roots and the only Christian nation in the Far East, the Philippines celebrates Christmas the longest and the merriest in the world. While Christmas officially begins on December 16, the Philippine Christmas season starts when the month of the year ends in “ber” and ends on January 6, the old calendar date for the feast of the Three Kings. Simbang Gabi (midnight mass) is a uniquely Filipino advent custom dating back 500 years ago. The nine-day Simbang Gabi starts on December 16 and ends of Christmas eve. Simbang Gabi masses are held either in the evenings or in the early mornings usually at 4:00 a.m. Church bells ring at 3:00 a.m. to announce and remind the people of the mass. Starting on the first day of September, radio stations from Aparri to Sulu begin airing Ang Pasko ay Sumapit, Pasko Na Naman, Miss Kita Kong Christmas, Jingle Bells, Rudolf the Red Nose Reindeer, Twelve Days of Christmas, Silent Night and Christmas songs in Tagalog, Ilocano, Bicolnon, Cebuano and other dialects. Christmas in the Philippines is like no other in the world. The month-long (December) celebration is colorful, exuberant, excessive – so typical of a Philippine fiesta. The Pasko (Christmas) season enlivens every Filipino home with the traditional parol (star-shaped lantern), belen (nativity crèche), Christmas trees, wreaths, and a myriad of yuletide ornaments. By night, it transforms the country into a glittering panorama. It also showcases Filipino artistry, innovativeness and craftsmanship through decors that rivals the best in the world. To those who have not spent Christmas in the Philippines, here’s a glimpse of what Christmas celebration is all about. The parol is the national symbol of Philippine Christmas which adorns every home during the holiday season. Some enterprising towns hire a “Ronda” (band) playing lively Christmas songs going around the major streets near the church waking people up for the pre-dawn mass. After the mass, one can savor freshly steamed puto bumbong (rice cake) or the delicious bibingka with hot salabat (ginger brew) or tsa-a (hot tea). 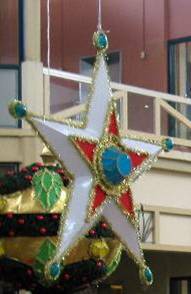 The parol, a star-shaped lantern, is the Philippines national symbol of Christmas. Influenced by the Mexican piñata, the parol adorns almost every home during the Christmas season. Expensive parols made of capiz shells are displayed in homes of well-to-do families. The town of San Fernando in Pampanga makes the largest and most beautiful parols in the country. Held on Christmas Eve, the panunuluyan is a commemoration of the flight of the Holy Family to Bethlehem. To the tune of Paul Lincke’s “Glowworm,” the image of St. Joseph and the Virgin Mary are wheeled out of the church courtyard in the company of two singers who will vocalize their parts. They stopped at three or four homes that represent the inns and in each sing their plight and request for lodgings. The innkeepers represented by a choir inform them that inns are already filled to capacity. In the end, the Holy Couple are wheeled into the church. The Philippines celebrates Christ-mas season the longest in the world. The Christ-mas holiday season begins on the first day of September that’s when the month of the year ends in “b-e-r” and officially ends on January 6th, the feast of the Three Kings.